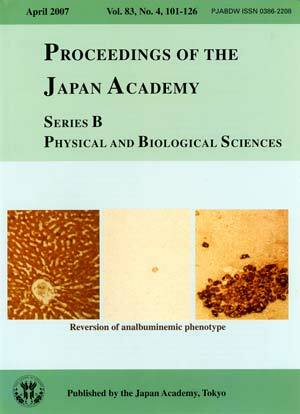 The discovery of a unique mutant of rats lacking an important and abundant protein, albumin, in serum by Dr. Sumi Nagase did attract two scientists' interest. 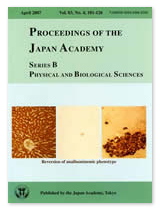 The scientists are Dr. Hiroyasu Esumi and Dr. Takashi Sugimura. It is quite important for science to feel interested in un-expected findings and recognize their significance underneath. In figure (left), Sprague-Dawley rat liver was stained for albumin. Albumin is synthesized by hepatocytes and secrete into the serum, therefore, all hepatocytes are positive for albumin in wild type rat liver. On the other hand, as shown in figure (center), in analbuminemic rat liver (at 6 weeks after birth), most of the hepatocytes are negative for albumin staining. Dr. Esumi and Dr. Sugimura revealed that a 7 base-pair deletion in an intron of the albumin gene blocks normal splicing of albumin mRNA precursor and gives rise to the analbuminemic phenotype. At the same time, they found the presence of albumin immunoreactive cells in quite small population (center figure) and observed the slight increase of these cells with aging. The observation inspired them to investigate any effect of carcinogens on phenotypic reversion of mutant liver cells. As shown in figure (right), when the analbuminemic rats were administrated 0.06% 3'-methyl-4-dimethlaminoazobenzene in basal pellet diet for 20 weeks, immunoreactive cells increased dramatically as either isolated ones or small clusters. Dr. Esumi and Dr. Sugimura found out that the reversion is due to alternative splicing of transcripts involving the mutated intron. They further realized that the analbuminemic rats are quite susceptible to chemical carcinogens, especially those forming bulky DNA base adducts, and produce cancers in target organs depending on the carcinogens. The works of Dr. Esumi and Dr. Sugimura have opened up a window to recognize a new mystery of nature. Curiosity to know the function of albumin in carcinogenesis, the effects of aging and carcinogens on mRNA splicing and many other questions from genetic and epigenetic aspects certainly provides us additional knowledge for better understanding of our life.